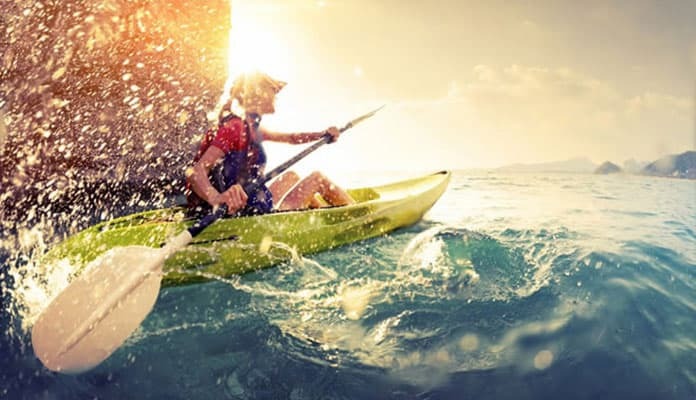 Kayaking is an ever changing and growing sport. There are many ways to propel yourself through the water, one of which is with pedals. Companies have designed high tech systems that will allow you to move hands free at speeds that are greater than with paddles. This is a great option for those looking to exercise their legs. We have put together a list of the best pedal kayaks that will get your weekend started right. This is the best pedal kayak for beginners and advanced kayakers. The pedal system is very easy to use, allowing you to get yourself up to speed in no time and maintain that top speed when you are moving. The stability of the kayak makes it great for fishing. You can cast while you are standing up and not worry about the boat tipping or you falling off. There is ample room for two people, and there is also great storage space. You can feel safe on this tandem pedal kayak. The stability means that it will not rock an move, even when you are moving around on the boat, and the storage will keep your belongings organized and safe. This is the best pedal fishing kayak. The design of the kayak keeps you sitting high in the water. This height gives you great stability when you are casting off or reeling in a fish. There are flush mount rod holders to give you a hands-free fishing experience, and when you combine this with the pedal movement, you can go in search of those fish while keeping your hands free for eating or preparing your gear. The seat is one of the most comfortable on the market. It is fully padded to give you optimum comfort, and the multiple adjustment points mean that you can create the perfect sitting position. The pedal drive system also gets you moving faster than ever before. 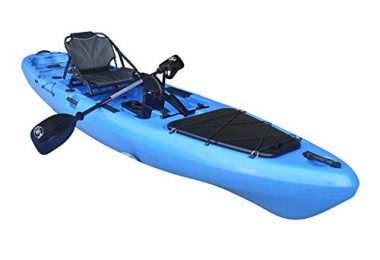 This really is a great fishing pedal kayak, but you will find that you also enjoy being out on this kayak no matter what you are doing. We love this brightly colored pedal driven kayak. With just one look at it, you want to get out there and have some fun. One of the best things about this kayak is the amount of cargo space you have. You can store a lot of your stuff, which makes fishing easier, and it is also essential for those long trips through the mountain lakes. If you re thinking of taking a long trip in this kayak, then you will be excited to hear about the seat. The adjustable and ergonomic seat had an aluminum frame for strength, padded backrest, and seat for comfort, and multiple control points to find the perfect sitting position for you. This is the best pedal driven kayak which was designed for speed. The pedal system is easy to use, and you will find that you can reach high speeds without breaking a sweat. The shape of the vessel also makes it ideal for moving through the water quickly, and the tracking is exceptional. The Hobie Sport is the best pedal powered kayak that is fully equipped. The comfortable, adjustable seat will keep you positioned correctly for even the longest trips. An advanced push pedal system has shoe loops to secure your feet while pedaling through rough water. The open sit on top style allows you to get up and move around with ease, perfect for activities like fishing. A large bungee storage area directly behind the seat will store everything you need for your trip while the dry storage at the front will keep your prized possessions free from water. This bright kayak with pedals will make any weekend trip amazing. Hobie has cornered the pedal powered kayak market. Features like the MirageDrive ensure you can paddle with ease while the tru-hull wire plugs allow you to drain water that accumulates in the hull. 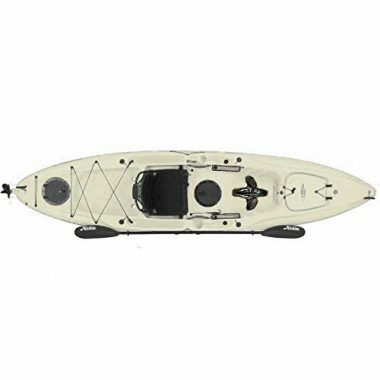 Much like the Sport, this foot paddle kayak has ample storage with the large dry storage in the bow and easy to use bungee system in the rear. Don’t worry about traveling in the shallows as this kayak comes with a paddle that will give you the option of easy small adjustments. This can be a perfect pedal fishing kayak for your next trip to the lake. For the size of the kayak, you will be surprised by the weight of it or the lack of weight. This is one of the lightest kayaks on our list, but do not be fooled by that, it still handles like a dream. As it is so light, you can effortlessly maneuver it onto the top of your car or portage from lake to lake. It is also one of the best pedal kayaks for hands-free fishing. Place your rod in the holder, pedal to move, and enjoy a glass of your favorite beverage. We love that you can pedal forwards and reverse with the pedaling system. When you are coasting at top speed, you will be moving at 3.5mph. You will also float smoothly across the water so you will not disturb the fish as you go. The seat will also give you enough comfort to keep going all day. The armchair-like seat is padded and comfortable while being sturdy and supportive enough to keep your muscles and joints from becoming strained. Thispedal powered fishing kayak has a 6 to 1 gear ratio. This means that you get a lot of acceleration and power without having to exert a lot of effort. This means that you can go out on the water for long trips with this nifty little kayak. This kayak has been designed to move through the water. Not only do you get speed with it, but you get maneuverability. Even when you are hitting those high speeds, you can still turn quickly and with ease. The flat platform on the kayak body gives you a great platform to stand on. This is ideal if you want to cast from a standing position, move around your vessel, or just stretch your legs. You will find that the kayak is stable and strong. There is also ample storage space, so if you are going out on a fishing trip. There is a lot of space for your tackle boxes, extra reels, etc. The Hobie Mirage Revolution 16 Kayak is one of the best kayaks with pedals on the market. The long 16 foot frame allows you to take it into open ocean without feeling small. There is more than enough storage for long three day weekend trips. The seat is comfortable while being supportive and the MirageDrive system ensures you always have a means of getting home. A rudder system in the rear will guide you in a straight line while the included paddle can maneuver you around tight spaces. This is a top of the line pedal powered kayak. Features like easy to use carry handles, cup holder, and an included two piece paddle make this a well equipped option. A sail mount on this kayak ensures it will not become obsolete any time soon and will keep you customizing your setup. Like to fish? 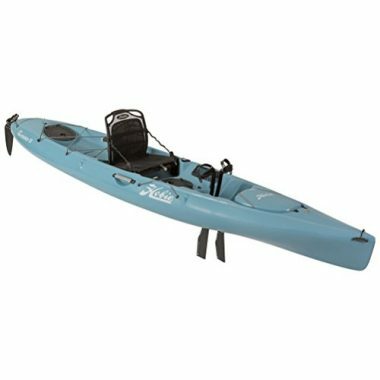 The included rod holder make this a great fishing kayak with foot pedals. This is one of the heavier kayaks sitting at nearly 90 pounds fully rigged, but the features make up for the added weight. The sleek design gives this boat an edge up. The rounded rear allows a rudder system to give you a more defined direction through the water. A comfortable seat is at the center of this design. It is completely adjustable and will ensure you stay comfortable no matter how long you are on the water. 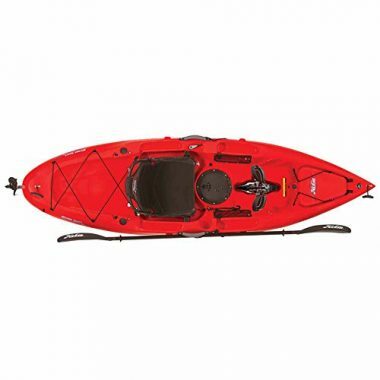 Bring all your gear with you with the ample storage this kayak offers. 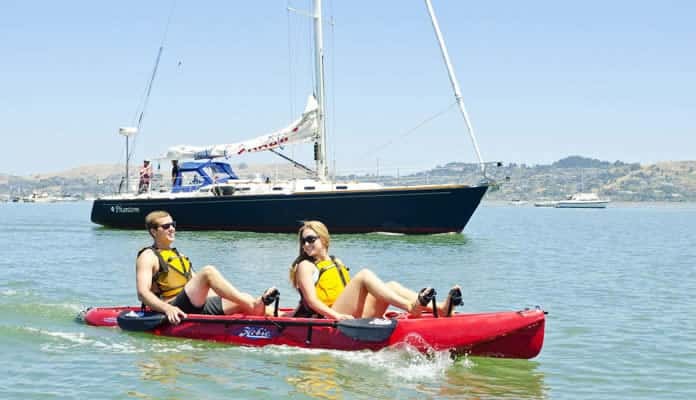 Pedal kayak reviews all agree that there are some things you should consider before getting your kayak. These factors include what you’ll be using it for, understanding the different types of pedal kayaks and even the pros and cons of using the pedals. What Is A Pedal Kayak, And Why Would I Buy One? Pedal kayaks are a variation of the traditional model just like there are fishing, whitewater and inflatable kayaks. What makes them so great is that you don’t have to use your hands to move your kayak. This gives you the ability to use your hands for other things like taking photos, looking for the best beach campsite or even fishing. 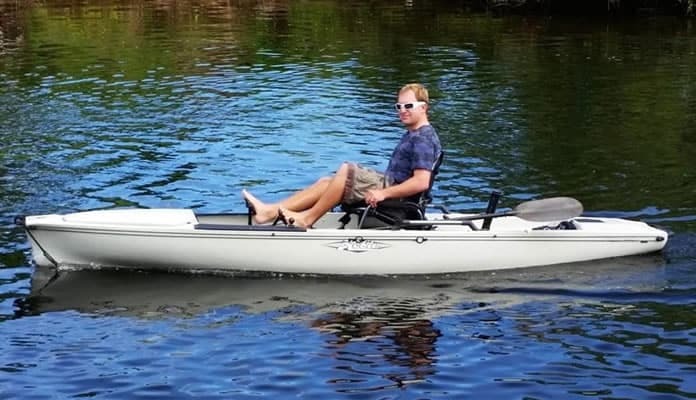 If you have any problems with your upper body a pedal kayak may be perfect for you. These rigs only use your lower body and put zero strain on your arms, shoulders or neck. This type of pedal kayak can allow you to get into nature and enjoy the outdoors without aggravating an injury. For people who like to fish on their pedal kayaks, you know how necessary it is for your hands to be free which this pedal kayak provides. You will be able to setup your line while you pedal to your ideal spot. There are even specially designed fishing pedal kayaks that have built in areas for your gear and drinks. The storage between pedals versus traditional kayaks can vary. Even though pedal kayaks require a space for the pedal system they usually offer the same or even more space than regular options. Specialty pedal kayaks will have more customized storage solutions so that you don’t have to bring along dry bags or backpacks. Fishing pedal kayaks are among the most available specialty pedal kayaks. These vessels will have addons like rod holders, tackle boxes and extra dry storage. The seat will also have added functionality and padding to make your time on the water that much more enjoyable. Fishing pedal kayak seats may sit higher on the boat which will allow you to have a better vantage point of the water. Some manufacturers actually have built in mechanisms that allow you to turn and rotate your seat. This reduces the amount of time you’ll spend trying to align your pedal kayak perfectly. Kayaks that have pedals also have more width. This gives them more stability and surface area to move around on. You will be able to throw casts without having to stabilize your kayak. Some of these vessels are so stable that you can get up off your seat and move around on the deck. You should check to see if your seat is removable as well which will give you even more space. Another added benefit of pedal kayaks is that most come with a built in rudder system. You have probably noticed that kayaks without rudders need constant effort to keep in a straight line. Pedal kayaks usually come with a rudder system that ensures you maintain your heading even in rough waters. This system may require some maintaining, but you will find that your hands will be available for the majority of the time. The controls will be near your seat which gives you easy access to them. This is one of the least known types of kayaks. 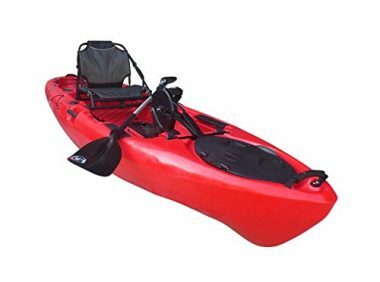 Often seen in water sport rental shops this type of kayak will allow you to spend time on the water without straining your upper body. This makes them perfect for people who want to get exercise while being on the water, or people who like to fish in their kayaks. These kayaks use your lower body to propel them through the water using propellers on the bottom of the kayak. These propellers push you through the water faster than you can using paddles. Just like regular kayaks, pedal kayaks have many different variations. With that being said, there are two main types of pedal kayaks: push and rotational. Even though they look quite similar they have vastly different technology that moves them. Instead of pedaling like a bicycle a push pedal system involves both legs repetitively moving the same way. The props underneath you require nearly constant leg movement to keep you at speed and fall off quite severely once you stop. 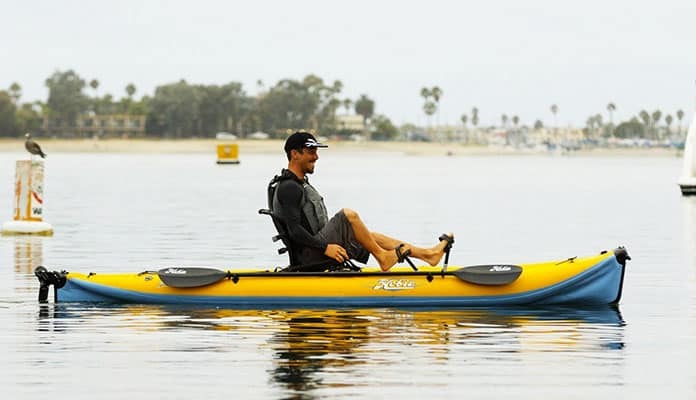 This type of pedal kayak will get you a very rigorous exercise and will need a person who is physically fit to operate, especially on longer trips. This type uses the lower part of your feet to move the kayak around instead of your entire lower body. Every time you push your feet down the blades will move back and forth. The push pedals will be better for people who aren’t necessarily looking for a workout when on the water. The only issue with this is that once you stop pressing the pedals the entire boat will stop moving. This will happen much faster when compared with that of a regular kayak paddles stopping. This type of propulsion system is the one you typically think of when you picture a pedal powered kayak. Similar to bicycling the pedals move one after the other causing the propellers to move you through the water. This requires much less effort and slows down much slower than the push pedal system. If you are just starting out with one of these kayaks the rotation system should be highest on your wish list. This will require your entire lower body moving and working to propel you forward. It will be quite similar to how you ride a bike. Since you have to move your legs you will need to have that area free of your gear. This type of propulsion, much like a bicycle, will need the large muscles in your legs to be working to move you forward. It will be more strenuous than the push pedals but also get you to your destination faster. One of the benefits is that when you stop pedaling your kayak will keep its momentum much better than the push pedals. Since the propeller keeps spinning after you stop it creates less drag in the water than the blades of the push pedals. Most pedal fishing kayak reviews agree that there are features that make the best pedal driven kayaks. Even though a longer kayak is easier to control it adds weight that needs to be propelled. The key is to find a balance that will allow you to control it while not overloading it with unnecessary weight. This will depend on the length and width. The length of these kayaks usually starts at 10 feet and goes up to over 16. 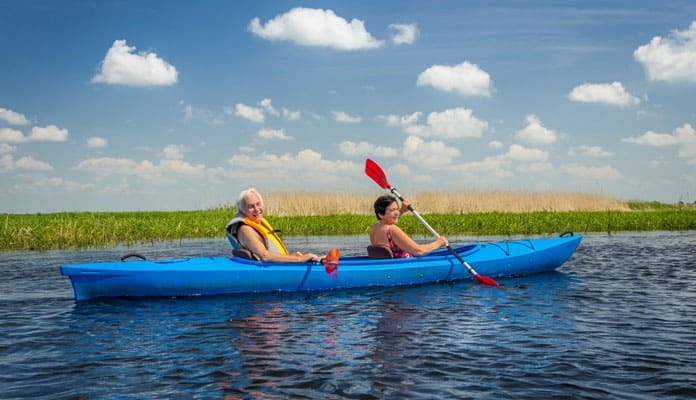 You should expect that a longer kayak will also come with a higher weight ranging from 45 to upwards of 100 pounds. Since there are many moving parts and technology that goes into these pedal kayaks the price will be higher than a typical kayak. This can push the introductory price to over $1000 and a well equipped option nearing the $3000 mark. What Are The Pros and Cons Of Using Pedals? Like anything in life, there are a lot of different pros and cons to using a pedal kayak over a traditional style. We will go over both the advantages and disadvantages in an effort to help you make the most informed decision possible. There are many advantages to this untraditional style of pedal kayak. We highly recommend trying it as that is the best way to get a feel for whether you like the style or not. In most cases, you have a lot more natural strength in your lower body than you do in your upper body. This strength transfers into speed as you can push the pedals with much more power in order to propel you faster through the water. This is especially good for beginners who may have trouble with long distance paddling. Paddles can sometimes produce a large splash which can not only get you wet but also generate a fair amount of noise. Pedaling your kayak avoids this as the propeller is under the water causing the sound to be muted. This is ideal for fishing as you will not experience as much noise and disturbances in the water thus scaring off your catch. This can also help you to gain the full experience of tranquility while out on the water as you will find a lot fewer disturbances. For those that head to the water to soak up some peace and quiet, you will love pedal powered kayaks. Kayaks of this style are incredibly quiet as all the movement happens under the water. This mutes the sound making it a much quieter experience for you. This means you can sit back with a cold drink and enjoy the peace and quiet of your hand’s free experience. A very enticing added benefit of using foot pedal kayaks is that your hands remain free throughout your trip. This allows you to get the feeling of doing less as you can enjoy a drink, take photos and even eat a sandwich as you glide atop the water’s surface. This feature is greatly ideal when on the water for fishing. Having your hands free allows you to focus your attention on your rod and not worry about where your paddle has to go. This also provides added stability for your kayak while you cast a line or unhook your catch. Your hands will still, at times, be needed to use your rudder but generally speaking you will be able to sit back and enjoy your scenery. Get your waterproof camera out so that you can take in all of the sites or use this opportunity to grab a cold drink from your cooler. Normal kayaks use your arm strength to move the kayak. But this movement takes a lot of energy and effort to perform. Your leg muscles, for most people, are stronger and more developed than those of your upper body. This means that you will be able to travel longer distances and go for a longer period of time without getting tired. If you are switching from a traditional boat you will find that a similar distance in your pedal kayak will require less energy than if you were to paddle the same route. Rotational pedal systems also keep their momentum which means you can travel longer distances with less effort as well. Even when you are resting your legs you will still have forward momentum. The best part about this is that you won’t have to exert the added energy to start from a completely motionless stance. The momentum will make this much easier and require even less energy. Instead of having wet paddles come over top of your boat, the propulsion happens under the water. This will keep you and your gear dry even in the roughest of conditions. There is almost no way that water can enter your boat in normal conditions. This is one of the many benefits of a pedal propulsion system. You won’t have to learn the skills you would on a traditional paddle kayak. The time it takes to learn how to use a pedal kayak isn’t that long. You won’t have to learn the proper posture for the forward stroke or even sculling. Instead, you can throw your pedal kayak into the water and head off on the lake. It is literally like pedaling a bike, a skill most people already have. There are a few disadvantages to this type of pedal kayak that are worth paying attention to. Since pedal kayaks have a propeller it will require deeper water than a traditional kayak. This rotating prop will have to have enough clearance in the water so that it can move you forward. A paddle only requires a small depth of water to move in. This also means that you won’t necessarily be able to go in grassy areas. If you are an avid fisherman this may be a dealbreaker for you. It is also more difficult to turn and stop your pedal kayak. Instead of using your paddle to stop your momentum you will have to rely on the prop or blades to slow you down. Some pedal kayaks have systems that allow you to raise the blades or prop which give you some extra clearance. It’s best to keep your eyes open for these models if that is a key feature for you. This is another area where pedal kayaks struggle with. Since the pedal mechanism is an extra piece when compared with a paddle version it adds extra weight. This can make it more difficult to lift onto your vehicle and transport to the beach. One trade off is that these boats have more storage for your gear. Since pedal kayaks are a relatively new option and have features that take time to design and make they will cost more money than a traditional rig. In the long run they will also take some time and energy to maintain and keep running at their best. It may even be worthwhile to keep some lubrication on board on longer trips. This will ensure that you have the ability to fix your rig if something goes wrong. Maintaining your pedal kayak will vary depending on where you use it. If you plan on bringing it into salt water you will need to clean it when you’re done for the day. This can simply be hosing it off when you get home, but it’s best to ensure that all the corrosive saltwater is removed from your boat. This type of water can also be hard on the moving parts of a pedal kayak. If you are planning on using it in salt water ensure that the mechanism is corrosion and rust resistant. This will help with the longevity and durability of your kayak. When looking to buy your next pedal powered kayak there are some things you should look for. These features look a bit different from what you would typically look for in a kayak. Pedal powered kayaks are generally less stable than their paddle powered counterparts. 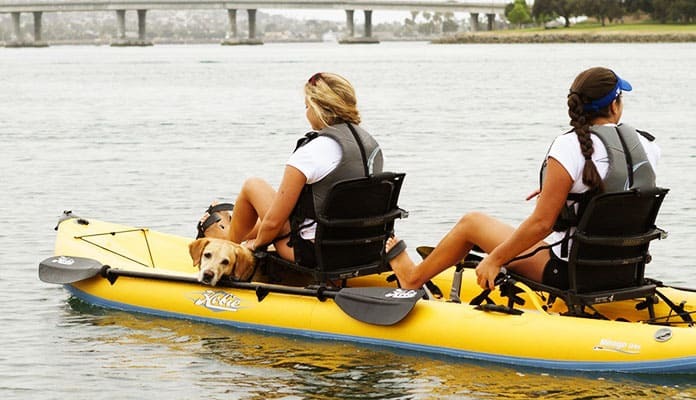 On a standard kayak, you can use the paddle to work towards keeping you stable. On a pedal powered kayak, you may find yourself gripping to the side of your boat, in the beginning, to help get your balance. You will notice that the hull of your pedal kayak has a bit more bulk to it sitting a bit wider. This is because this style of kayak rides a bit more unstable than the paddle boats. This helps to make up for some of the stability issues of this style of kayak. The more space will also give you more room for your gear. 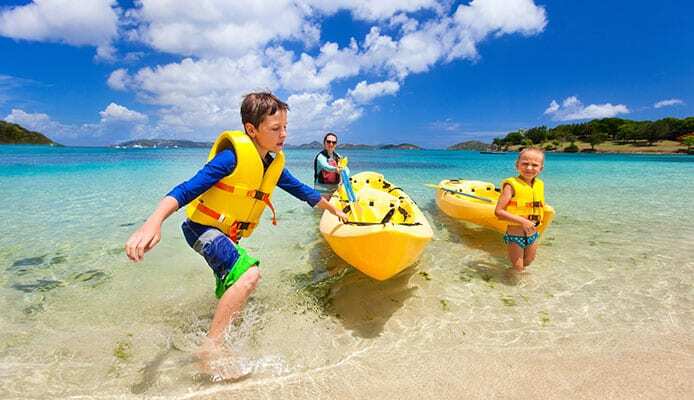 You may think that as your legs are generally much stronger than your arms, you will have an easier time maneuvering with a pedal powered boat. Unfortunately, this is not the truth and instead it is actually quite a bit more limited. This style pedal kayak has a hand activated rudder steering system. While useful, this provides far less efficient tracking than their paddle counterpart. The reason for this remains under debate but boils down to the size of the rudder. The location of the rudder also plays an important role. A paddle placed on the far side of the boat will work much more efficiently in turning than a rudder located in the center of your boat. This style boat often makes much wider turns than a traditional style kayak. This often takes kayakers a while to get used to the change. The rudder is controlled by a handheld lever that is easy to reach and located inside the cockpit of the kayak. Most kayakers agree that this rudder has a significant effect on your boats speed. On average you will notice a loss of about 10% of your typical speed which can be frustrating if on the water with paddlers. You will also find yourself with added restrictions as you can not move these boats into shallow waters as the rudder is far more likely to get stuck. Putting your kayak in the water will be much like that of a more traditional boat. Some rudder systems will have to be lowered once you get to a deeper depth, but for the most part it is the same. We recommend bringing along a paddle just in case the pedal system stops working. You can use paddle clips to attach a paddle to the side of your boat and you won’t even know it’s there. Pedal kayaks like to be in deeper water than flat bottomed boats. You will have to be careful when entering shallow waters or areas that have weeds or tree stumps that can brush against the bottom of your boat. This can cause issues with the propeller or blades that move your kayak forward through the water. You’ll have to use a paddle if you need to go through water that’s on the low side. It’s not worth risking the propulsion system. It’s much easier to use a paddle in this type of situation rather than the pedals. If you get a weed stuck in the prop it’s nearly impossible to remove without getting into the water. Keep this in mind when you’re on your next fishing trip. Lots of fishermen prefer a pedal kayak to a standard style. This is primarily because this style kayak allows you a hands free experience which allows you to focus more time on fishing. This allows you a much easier time to carry your rods and other gear. Having your hands free will allow you to move as you fish which will deliver a much more efficient experience. Being able to move where the fish go is important but if you are juggling rods and paddles, it can become quite difficult. This can be a lot more fun as you can easily have some free movement to the go where you like. This style of boat is also preferred as it creates far less noise. The lack of disturbance in the water makes it so the fish don’t get scared. This provides you with a better experience in the water with plenty of fish around you. Many fishermen enjoys the freedom and relaxation in this style of boat. Getting used to moving your kayak with pedals can be weird at first. But you will get used to the motion faster than you may think. You may need to plan where you launch your boat more carefully as they can be heavier than regular options. The setup may also take an extra step as you will have to put the blades or the propeller on once you get it to the beach. This is also true of the seat. Putting it on at the water will take some of the weight off your shoulders and make it easier to get it on the beach. Positioning your seat in the perfect position will save your body from incorrect posture or the strain of awkward repetitive movements. This is especially true of long distance trips over the weekend. Ensuring you have your seat in a comfortable position will allow you to pedal your kayak for hours without even noticing it. One of the biggest differences is that you’ll feel unstable when you first start using your pedal kayak. The motion of moving your feet will feel weird at first but will become natural after a bit of time. This unstable feeling will actually turn into more control over time. You will find that shifting your weight can actually make more power through your legs. The rudder is another aspect you will have to become comfortable with. You not only have to remember that you need to steer your rig with the rudder but also learn how to use it. No longer do you have to use your paddles to steer. Instead, you will simply have to turn the rudder and you’ll be pointed where you want to go. The system will be by the driver’s seat within arms reach. Getting used to this system will also take a bit of time. Figuring out how to get the pedal kayak in a straight line can be a little tricky, but with some trial and error you will get it down in no time. The handle will be everything you need to steer you in the right direction. Small movements will be able to turn your boart with precision. This means you will have a near hands free operation of your boat. You will have to use your hands at some points, but significantly less than that of a traditional boat. Q: How fast can a pedal kayak go? A: For the most part pedal kayaks will keep up and even sometimes exceed a paddle version. This is a hard question to answer because it all depends on what you’re going to be using it for, how strong your legs are versus your arm strength – the list can go on. If you are simply trying to get to the other side of the lake as fast as you can you may be missing the point of kayaking as a whole. But if you are curious about the speed difference you will hardly notice a difference between a traditional kayak and a pedal one. You essentially create the same amount of thrust if you are using your legs or arms to propel your kayak. This is especially true when you are comparing your own power. If you have a friend who has the other version and you have a race you will see that there is very little difference. A push pedal system will go slower than a rotational setup. The difference comes from the blade setup. Push pedals will make the kayak loose momentum quicker than that of a rotational or even traditional boat. But with that being said, rotational pedal kayaks require more effort and strength to move forward. Q: How does a pedal kayak work? A: Every single company that makes pedal kayaks use different terminologies that describe them. But they all use similar systems. Some use a pedal system like a bicycle where you pedal one foot over the other. This, in turn, makes the blades on the propeller rotate thus pushing you forward. Others use a system in which you simply push your foot forward. This moves long blades, that protrude from the bottom of your kayak, back and forth through the water which move you forward. One issue with these systems is that most don’t have reverse. You can turn yourself by using one leg more than the other, but there is no way of reversing like in a traditional kayak. Q: How do you steer a pedal kayak? A: You won’t be steering a pedal kayak like a traditional kayak. The biggest advantage of a pedal kayak is that you have your hands free at all times. This gives you the ability to hold a camera when taking photos on the water or throwing the perfect cast when fishing from your kayak. There are a couple different ways you can steer these specialized pedal kayaks. Some have built in rudder systems that you can easily control from your seat. All you have to do is turn the rudder and your boat will go where you want it. Other boats allow each of your feet to move independently. This is one of the easiest ways to turn your kayak as you just have to use one foot more than the other. This will act as if you are paddling more on one side of the kayak than the other and will turn you the way you want to go. A: Height does make a difference. The higher a kayak sits in the water the less stable it’ll be. This can be combated by having a wider pedal kayak but will still be more unstable than a boat that sits lower in the water. 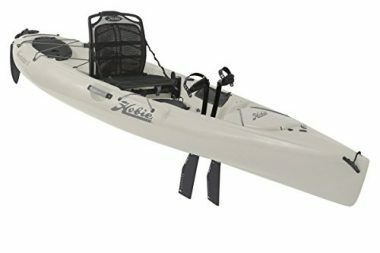 If you are looking for a fishing pedal kayak you will especially want one that doesn’t ride too high in the water as this can affect how you throw casts. Q: Can Pedal Powered Kayaks Go Backwards? A: This is the only thing that these types of kayaks can’t do. There are a couple of ways you can get around this, but there’s no good solution. One way is to bring along a paddle just in case. This will allow you to have a backup way of moving through the water. It doesn’t happen often but if the pedal system has a hiccup it’s good to be able to turn to another source of power. A paddle will also give you the ability to turn around. Pedal powered kayaks are perfect for people who want to get an increased workout or who have injuries to their upper body. Not having to constantly paddling will allow you to take part in activities like fishing or snapping the best photographs. Enjoy kayaking on a pedal powered kayak? Tried on our list? Let us know how you liked it in the comment section below.